The occupation of the island of Capri dates back to antiquity, with the Greeks and Romans. The emperors Augustus and Tiberius made it their favorite holiday resort, building villas there. This island-garden is a rock with lush vegetation, whose cut coast is bathed by a particularly bright Mediterranean. The two small towns, Capri and Anacapri, are formed by mazes of narrow streets with white facades. The first is the most touristy, we dock below, in Marina Grande. The second is less expensive and has kept traces of authenticity. Small buses tailored to the narrow road that crosses the island connect these different localities. We can discover these two villages, including their churches, like that of the Archangel Saint Michel in Anacapri and its amazing pavement Neapolitan; or Piazza Piazzetta in Capri. The island has many curiosities: the ancient Villa Jovis, the small harbor of the Marina Piccola, the Villa San Michele, the gardens of Augustus, the Charterhouse San Giacomo, or the Villa Malaparte which is located at the end of the Massullo point. The natural attractions are numerous, with the rocky coast (for example the Faraglioni site), the Monte Solaro, the Grotta Azzura (visit by boat), the Arco Naturale. Many trails allow to discover these natural resources and some villas. Several marine caves surround the island, accessed by boat. 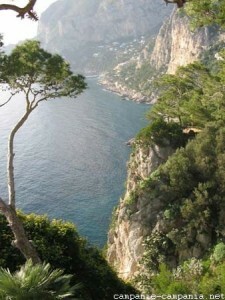 The city of Capri comprises 7000 inhabitants, half of that of the island. Of course not counting the affluence in tourist season (in August, 20 000 people disembark every day on the island). 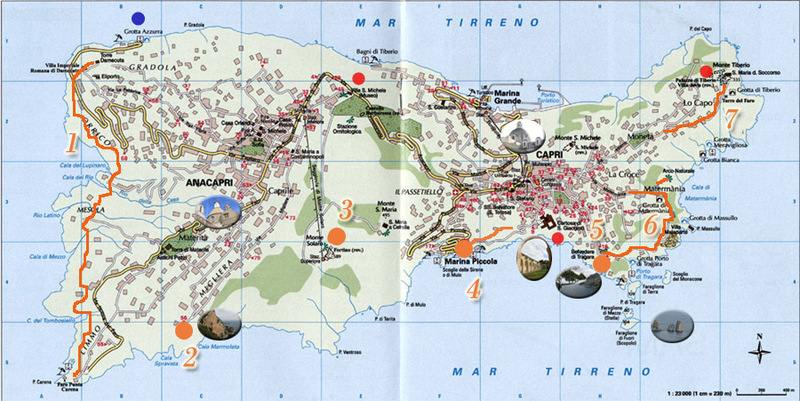 Map of the island of Capri, main natural and tourist sites.